Torrevieja is a beautiful coastal town in the Alicante province, about 40 kilometers from the capital city Alicante. A popular destination, as this area is known for its beautiful beaches, particularly around Torrevieja are several sandy beaches and creeks. Torrevieja is surrounded by two large natural salt lakes, ideal for people who are suffering from illenisses such as rheumatism, arthritis or heart problems, as the salt in these lakes seem to enlighten the pain symptoms. In addition, there is always a lovely warm climate in the Alicante region. 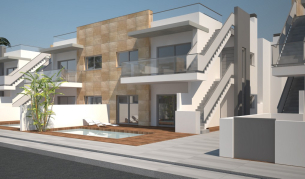 Houses in Torrevieja are very popular, as they are much cheaper than in other regions. You can also check our Best Bargain Deals in the province of Alicante. Interested in one of these properties? Just fill in the form to receive more information. Off course, no obligations. More properties in Torrevieja or in the Alicante region.